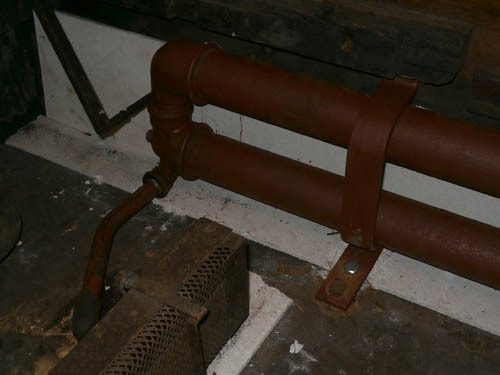 Getting the steam heating pipes in place was easy compared to plumbing in the supply and drain pipes. Making new ones took ages, and the hole through the floor for the pipes was never quite big enough to get the fitting through or it was in slightly the wrong place. A lot of drilling and chiselling took place. The Bowden cables and associated controls provided us with hours of endless fun (NOT!). Several were totally seized and freeing them off was not an easy task. One of the control handles plates was broken in three places, but we managed to glue is together again. We are offering a small prize to the first person who can spot which one it is! 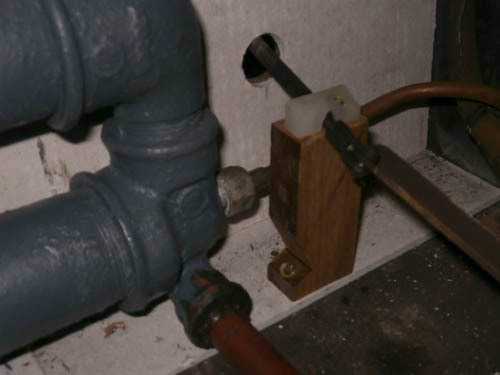 When the steam supply pipe was fitted to the end of the heating pipe, of course it was right in the way of the place where the wooden pillar which supported the bottom end of the cable should go. More chopping and changing required! Prior to starting to paint the ceiling, the walls were screened off with polythene sheeting. First of all the vent covers and luggage rackes were taken down. 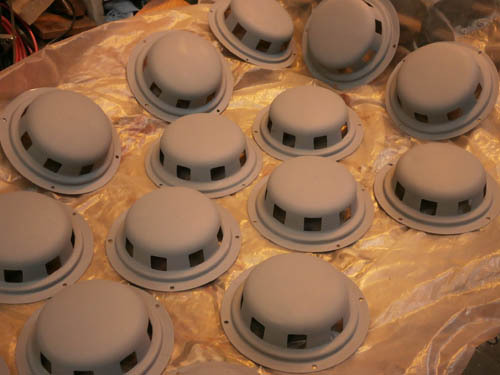 After sanding off scale and rust, the vent covers were sprayed with grey primer (see photo) and then with bronze gloss paint. Lighting in both vehicles was improved by the fitting of corn LED bulbs to the bulkhead fittings and to the vestibules. The new 2W devices were ever-so-much brighter than the 15W filament bulbs they replaced. It is the intention to fully kit out these vehicles with LEDs in due course. The overhead lights down the centre of the coach remain filament for the present - the rather odd LMS trasnlucent shades round these lamp clusters were looking a bit tired, so some of the glass sides have had new panes cut by Jim Pairman, our expert 2mm glass cutter.